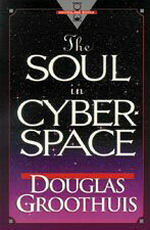 Books | The Soul in Cyberspace | Watchman Fellowship, Inc.
"While most Christians are content with a superficial and pragmatic assessment of the new information technologies, Douglas Groothuis probes more deeply. He wisely recognizes the symbolic power of technology: machines don't just do things, they shape us by equipping our imaginations and language with powerful new images, metaphors, and assumptions. Groothuis has done a great service in alerting us to the temptations that will challenge the twenty-first century church, and in providing the tools to discern what is real, what is true, and what is to be treasured."